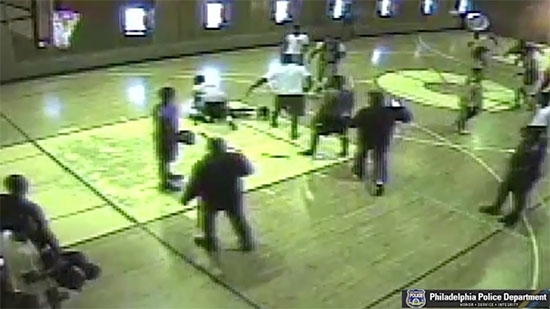 Philadelphia Police are looking for two men after they were caught on security cameras punching a man unconscious during a charity basketball game. It happened on January 28th around 4 pm at International Christian High School on the 400 block of East Tabor Road. The 25-year-old victim was on the bench when he was punched by a man who came at him from the court during the game. The victim got up and was moving about to shake off that first hit. That's when a second man approached the victim and punched/pushed him. He fell to the ground unconscious near the foul line. The suspects fled in an unknown direction. The victim was taken to Elkins Park, Albert Einstein Medical Center where he was treated for facial injuries. The first suspect is described as a black male, in his late teens to early twenties. He was wearing a white t-shirt, black shorts, gray sneakers. The second suspect is described as a black male, late teens to early twenties. He was wearing a dark-colored tank top over a white t-shirt and gray shorts. Watch the video below. A man who broke his jaw when he was kicked in the face by a Dover police officer settled his lawsuit for $300,000. The lawsuit was filed on behalf of Lateef Dickerson by the American Civil Liberties Union back in 2015. The details of that settlement were released on Monday by the city of Dover after the attorney general's office ruled that the city had previously violated the Freedom of Information Act by refusing to release its details. The Associated Press and The News Journal of Wilmington filed the FOIA challenges. The initial incident happened in 2013. It was caught on police dash cam video. Cpl. Thomas Webster IV can be seen kicking Dickerson while trying to get him to the ground. Webster was acquitted of assault charges. Meanwhile, Dickerson was arrested later in 2015 and is now spending 10 years in prison on gun charges. Watch video of the incident below. A Pennsylvania woman died after she got her arm caught in a clothing donation drop box. Northumberland County Coroner James Kelley says that 56-year-old Judith Permar died from a combination of hypothermia and trauma injuries sustained from the accident. It happened in the early morning hours on Sunday. The Mount Carmel woman went to the donation box in the small village of Natalie at 2 a.m. Permer used a step stool to reach up into the bin. The stool gave way and her left arm became stuck. She broke her arm and wrist and couldn't get out. She was found dead six hours later. Mount Carmel Township is located about 60 miles northeast of Harrisburg.